The Model 885 Synthesized In Circuit LCR/ESR Meter is the first handheld meter of this type on the market, with a wide range of test frequencies up to 10kHz and many measurement parameters including Z, L, C, DCR, ESR, D, Q, and Ø as well. The 885 is designed for both component evaluation on the production line and fundamental impedance testing for bench top applications. With a built in direct test fixture, you can test the lead components very easily. The optional 4 wire test clip can give a convenient connection to larger components and assemblies with the accuracy of 4 wire testing. 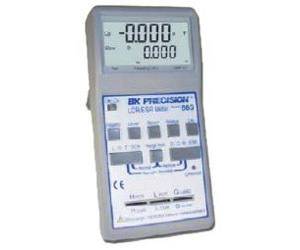 The LCR meters offer fast, reliable, and versatile testing at low cost.